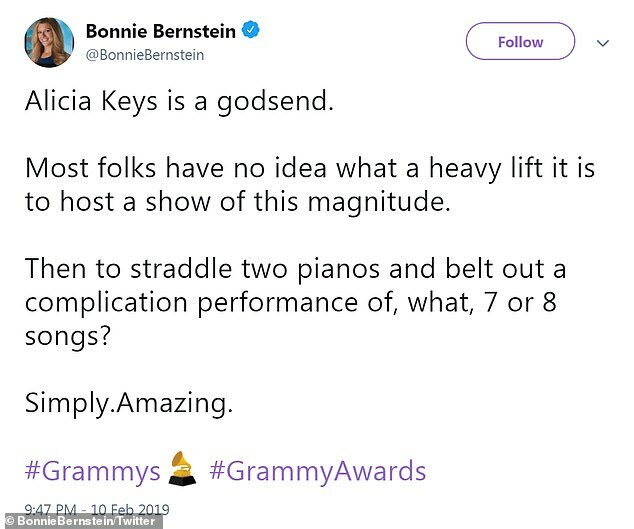 And it was Keys herself who would deliver one of the most powerful performances of the night - with a medley that included classics from five different decades. Sat between two pianos, Keys wowed the audience at the Los Angeles Staples Center and viewers at home as she began to play them both at the same time. 'I've been thinking so much about the people and the music that have inspired me, and I want to give a shout out to Hazel Scott because I always wanted to play to pianos,' she said, referring to the late jazz pianist and movie star. Keys first began with the song that she said she thinks about when she reflects on 'heartache and heartbreak', playing Roberta Flack's 1973 tune Killing Me Softly, later popularized by Lauryn Hill and The Fugees. 'Or when it's time to move on, this is the song,' she said, breaking into Juice World's recent hit Lucid Dreams before switching to Nat King Cole's 1952 classic Unforgettable. 'Now, who didn't with they wrote this song? I know I do,' she said as she began singing Kings of Leon's 2008 hit Use Somebody. That turned into In My Feelings, Drake's song of the summer, and Boo'd Up by Ella Mai before Keys began playing Doo-Wop (That Thing), saying she wished she had written the entire Miseducation of Lauryn Hill album. 'Then, finally, you write the song you wish you wrote,' Keys said before she broke into her own tune Empire State Of Mind. 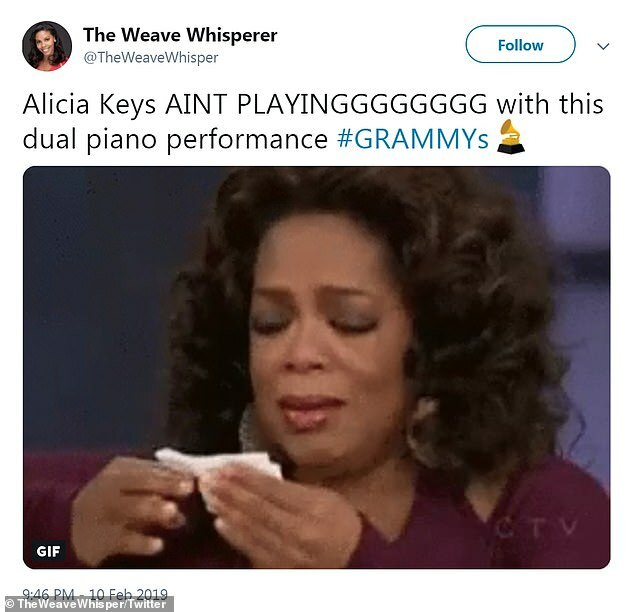 Keys' medley was an instant hit on Twitter, with many calling it the best performance in a Grammys that had already been praised throughout the night. 'Okay but who is doing it like Alicia Keys she literally has more stage presence than half the industry and she's only up there with two pianos,' one fan wrote. 'Alicia Keys is refreshing everyone's memory on why she's one of the greatest of all time,' one commenter wrote. 'When the best performer of the night is also the host. 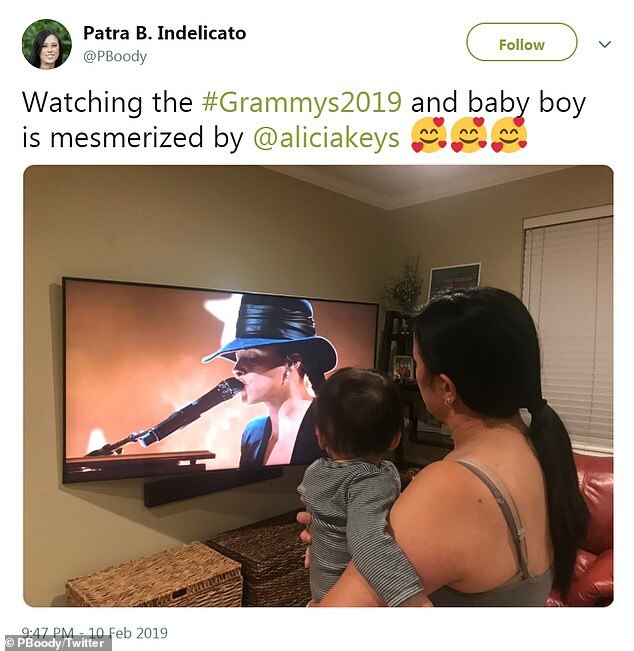 #GRAMMYs @aliciakeys,' another added. 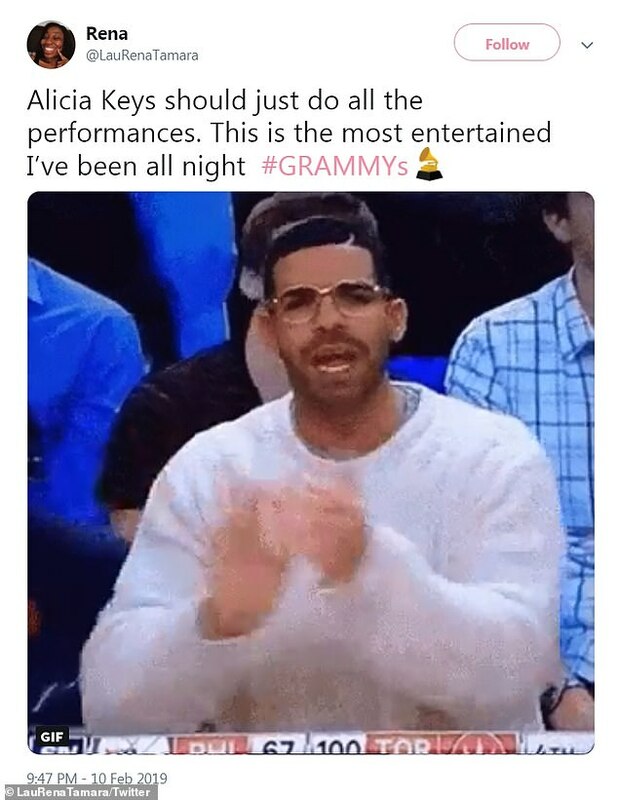 Ana Navarro joked that Alicia Keys was doing such a good job she should 'just go ahead and host the Oscars too'. Many said they would've been happy to keep watching Keys perform for the rest of the night. 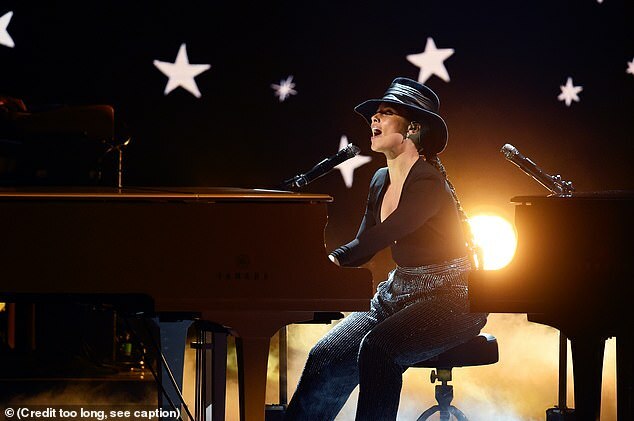 'The @aliciakeys two piano medley was the best thing on tv tonight, this week, probably for a very long time,' one fan wrote. 'I could have settled in for a whole Alicia Keys concert after that performance, didn't want it to end,' another added. 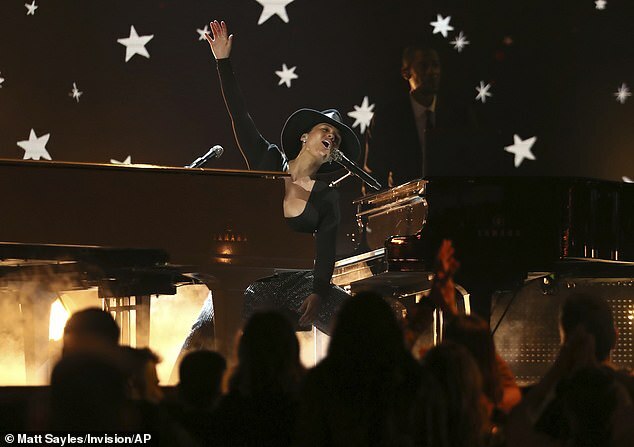 'Give me Alicia Keys and 2 pianos the rest of the night and I'm good,' one viewer quipped. 'I'm the epitome of non-target market of Grammys. 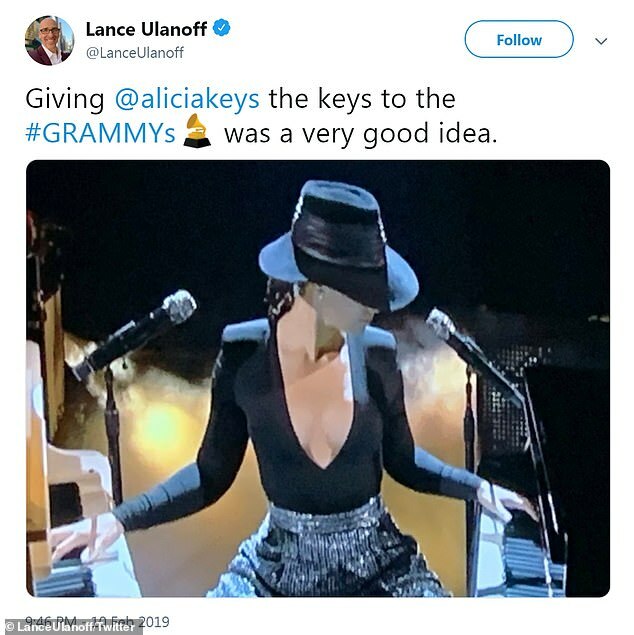 You know what, I'll tune in every year if @aliciakeys hosts and does a 20-minute riff of everyone's best songs,' added Paul Kane. 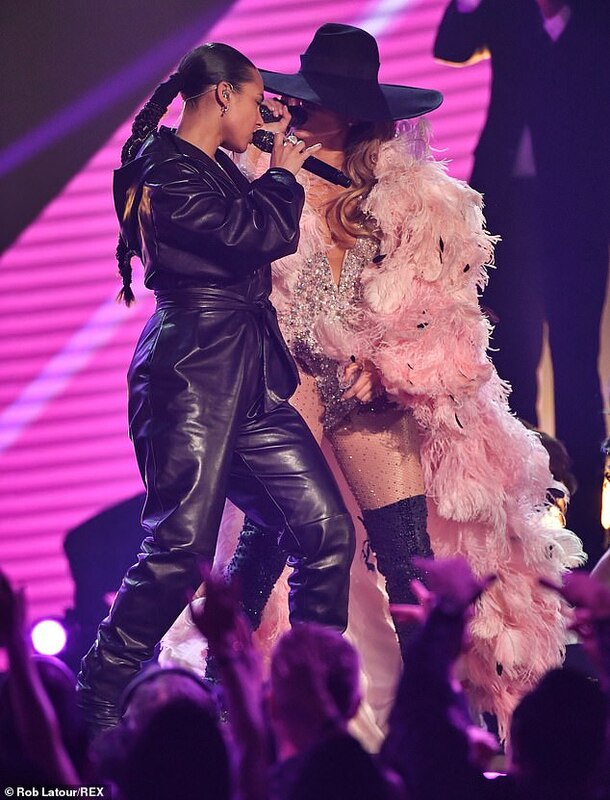 Many marveled at Keys' ability to host the show with ease and then pull off an incredible performance, which some suspected was actually a filler after Ariana Grande pulled out of the show last minute. 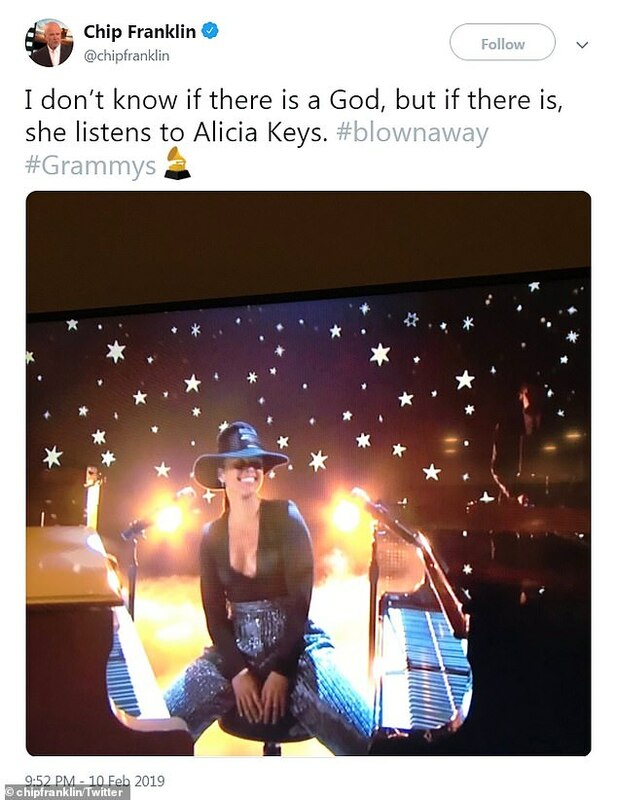 'Alicia Keys is a godsend. Most folks have no idea what a heavy lift it is to host a show of this magnitude. Then to straddle two pianos and belt out a complication performance of, what, 7 or 8 songs? Simply. Amazing,' one fan wrote. 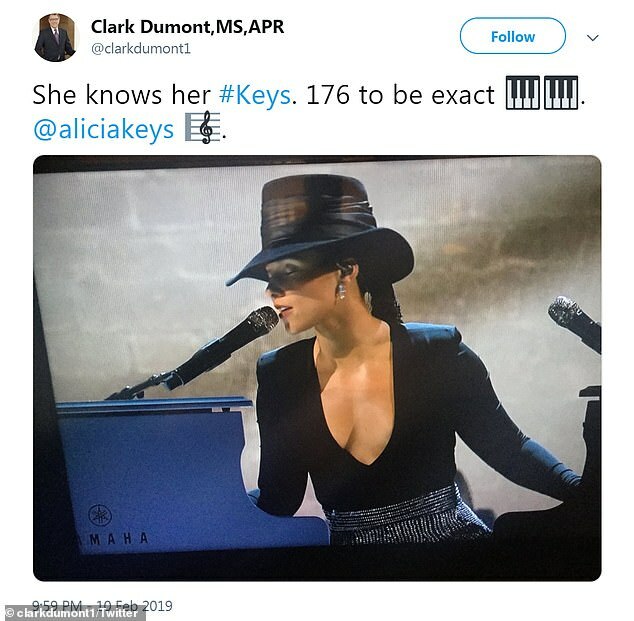 'Hats off to Alicia Keys...What a magnificent performance at #GRAMMYs both as a presenter and (incredible) singer and piano player,' another added. 'Award shows are hard - this is a fantastic show. Diana. Dolly. And @aliciakeys is perfect,' Billy Eichner wrote. 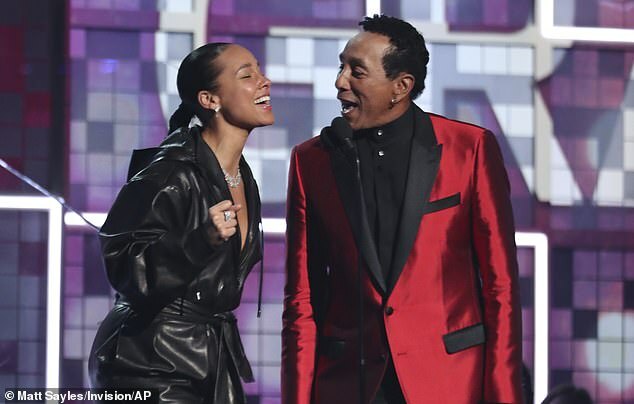 'Giving @aliciakeys the keys to the #GRAMMYs was a very good idea,' another added. 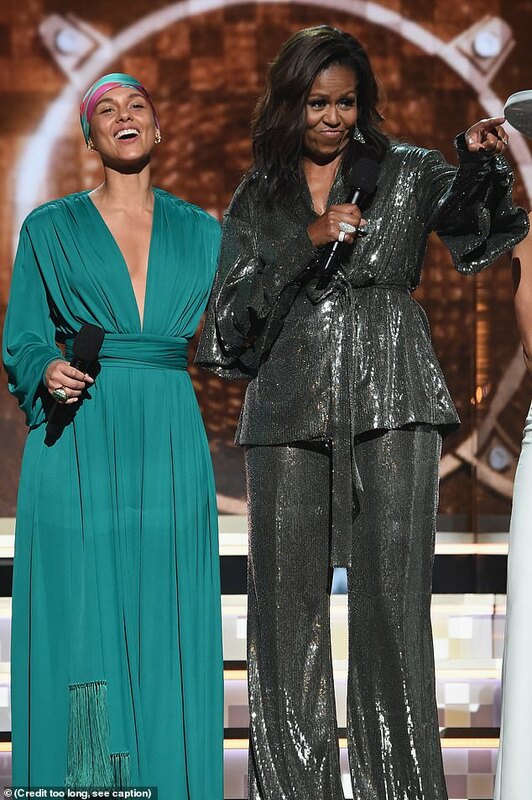 And she didn't take the position lightly, kicking off the night with Michelle Obama, crooning with Smokey Robinson, and dancing with Jennifer Lopez. 'Do you feel that love in the building? This is love, this is life, this is living, this is light and all because of music,' she told the audience.